What began as an idea to work with the native henequen and sansevieria plants has grown to become my life’s passion—to fully understand the Mayan culture and the environment in which it flourishes. Through an ongoing exchange of ideas, knowledge and passions, we are building a luxury brand that supports the knowledge of artisans and their families. These communities have spent their whole lives working with the plant fibers that sustain them. Now, through textile innovation and bespoke design, Angela Damman is helping these artisans breathe new life into their ancient traditions, and bring renewed vitality to their communities. From land to loom, one Angela Damman product can generate economic opportunities in several communities, and each one carries the mark of the hands that made it. As a daughter of the land, I’ve always envisioned a creative life for my family that is rooted in connectedness—to a culture, a people and more importantly, to a way of life. A life where less is more. Where made by hand also means harvesting the plants, extracting their fibers, mixing our own organic dyes, and spinning and weaving the fibers. The inspiration for our vision came from the incredible and talented artisans who possess knowledge that has been passed down through many generations. It was here I began to see the possibilities for textile innovation unlike anything I have encountered and now in collaboration with our artisans, we’re reaching a new level of sophistication in textile and luxury product design – while at the same time, sustaining and nourishing a mindful way of life. As an artist and entrepreneur, Angela Damman has brought her passion for design and her experience in sustainable product innovation to Yucatán. What began as a six-month adventure with her husband and young children, quickly grew to become a thriving collaboration with talented local artisans. Since 2012, Angela has worked side by side with her artisans, creating luxury textiles and products from native plant fibers. Inspired by age-old techniques of making useful goods from henequen and sansevieria, she spent over two years researching and experimenting with the process to establish new ways of working with the fiber. 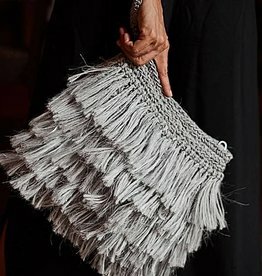 It has become an ongoing collaboration with artisans in the pueblos of Yucatán, weaving their centuries-old knowledge with her contemporary design aesthetic, resulting in luxury goods made entirely by hand, and by heart.